Joy Pendlebury is a dedicated artist in Lexington's Creative Expressions art program. Joy works hard to develop her own style and has an eye for design and color along with a keen ability to see what changes need to be made in order to make her work the best that it can be. She welcomes input from others and actually enjoys the critiquing portion of class time. Her painting, “Diva,” was recently selected as the cover artwork for the ARC Otsego’s VOICE, which was an incredible honor for Joy. This year’s exhibit marks the VOICE’s tenth anniversary celebrating the creative voices of artists with disabilities. The exhibition and reception were held at the Martin Mullen Gallery at SUNY Oneonta on July 18th. Many kind words were said about Joy and her art during the awards ceremony. She was told that her painting of a confident young woman gave a face to the VOICE. 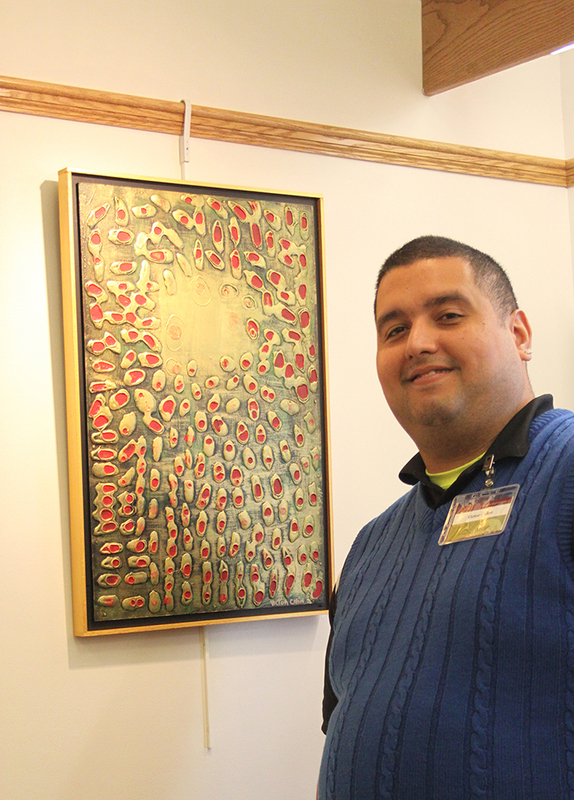 Lexington artists had a wonderfully successful art opening at the Northville Public Library last Tuesday evening. Many people came to meet our talented artists and see their creations. The Leader Herald had a very nice piece in their Sunday edition which you can read by clicking here. The show is on display through June 30 at the Northville Library Gallery located at 341 South Third Street, Northville. Artists from Lexington’s Creative Expressions program, including Debbie Woodruff who recently took first place at the 2014 NYSACRA Art Exhibit which was held at the Sagamore Hotel in Bolton Landing on April 10, will be featured in a Sacandaga Valley Arts Network (SVAN) Art Show at the Northville Library Gallery, located at 341 South Third Street, Northville, from May 1 through June 30. There will be a reception for the featured artists on Tuesday, May 13 from 6:00pm-8:00pm at the Northville Library Gallery. The Gallery hours for this show are Monday, Saturday 9:00am-12:00pm; Tuesday 9:00am-8:00pm; Wednesday, Thursday, Friday 9:00am-4:00pm. The Gallery is free of admission and open to the public. Information about this show may be found at www.svanarts.org or by calling the Gallery at (518) 863-6922. Lexington’s Creative Expressions program promotes independence and choice through outcome based programs and involvement in the community. Goals focus on social activity and physical skills plus health and wellness awareness. Creative Expressions artists have participated in many local exhibitions, have won several awards and have raised more than $3,600.00 for the Paul Nigra Center for the Creative Arts through the sale of their artwork. For more information about Lexington’s Creative Expressions program, please call Lexington at (518) 773-7931 or visit www.lexingtoncenter.org.